Hong Kong Gold Coast Hotel is 33 km or about a 20-minute drive from Hong Kong International Airport, and about 25 minutes from downtown Tsim Sha Tsui, Tsing Yi, and Tsuen Wan. The Hong Kong Gold Coast Hotel is a seaside oasis featuring 2 palm-fringed outdoor pools, water park, and fully-equipped gym. When it comes time to dine, onsite restaurant selections include a restaurant and cafe. Every guestroom offers views of South China Sea. LCD TVs come with satellite service. Just 20 minutes from the airport, approximately 30 minutes from Central, and 25 minutes from Tsim Sha Tsui, Hong Kong Gold Coast Hotel provides an escape from the city's hustle and bustle. Regular shuttle buses run from the hotel to downtown Tsim Sha Tsui in Kowloon, Tsuen Wan or Tsing Yi (fees apply). On-site recreation includes swimming pools with waterslides, a fitness center and a children’s play room (fees apply). Facilities: Children's activities include swimming pools with water slides, sand pit, outdoor kid’s island and mini train ride (fees apply) game room for video games, education games, story books, and a kid's club. Fee(s) subject to change without notice. The Hong Kong Gold Coast Hotel has a grand ballroom, a wedding chapel and terrace, beautiful outdoor gardens and 17 meeting rooms. Buffet breakfast (surcharge) available on site. Internet access: Complimentary WiFi is available for guest use in public areas. Conference/function room(s): There are 17 meeting rooms in the lobby area, a 557 square-meter conference space. Up to 240 guests may be accommodated through combining 5 meeting rooms into a large area. Other: Meeting packages are available for half- and full-day hire, and include a full range of audiovisual equipment. The Hong Kong Gold Coast Hotel is a smoke-free property. Valet and self-parking is available for a fee. YUE - Cantonese award-winning restaurant, an ideal dining place with authentic culinary sensation and exquisite ambiance and service. Must-try items include the Gold Coast Starlight dim sum platter. Lobby Lounge - Floor-to-ceiling windows offer views of the pool and nearby foliage. Features Sunday brunch buffet, English high tea, and continental a la carte menu. Café Lagoon - Serves international cuisine. 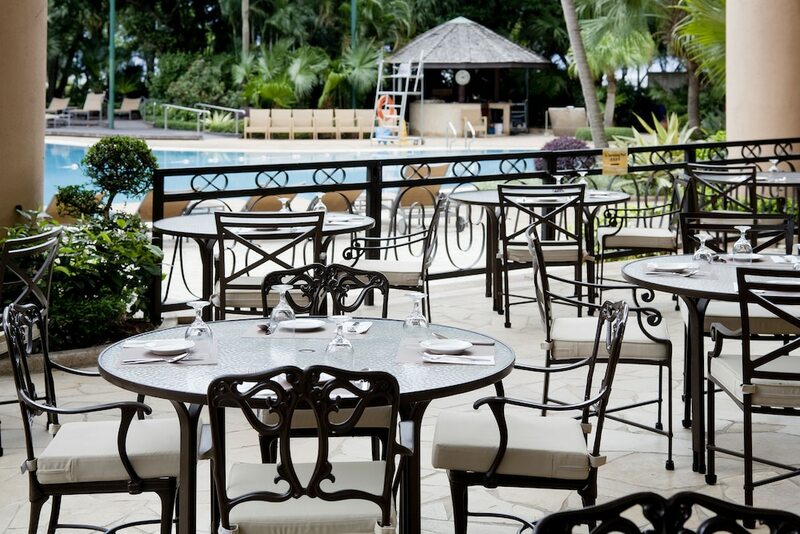 Restful setting, specializing in well-known barbecued cuisine and freshly prepared delicacies. Satay Inn - Singaporean and Malaysian cuisine. Signature dishes are Hainanese Chicken Rice and Chili Crab. Prime Rib - Family-friendly restaurant with a menu inspired by the old guard steakhouses. Serves a variety of prime cuts classically paired with standout sides and tastefully selected wines. The smoke-free Hong Kong Gold Coast Hotel offers a full range of recreational activities. Facilities include 2 free-form swimming pools with water slides, an onsite water park, sand pit, outdoor kid’s island, rope course, and gymnasium. The Gold Coast Kids Club Sharks and Pirates Adventure Zone provides fun and excitement for children. Additionally, team building retreats are tailored to guest requirements. Rollaway/extra beds are available for HKD 350.0 per day.